Read the latest edition of your supporter newsletter and meet the children whose lives you are transforming. In this edition we focus on a major achievement that simply wouldn’t be possible without the support of caring and committed people like you. Since 1990, the number of children dying before they reach their fifth birthday has been halved. That’s 50 percent more children celebrating their fifth birthday – an immense achievement made possible by you. Your support for children has helped to change their world. In your newsletter, you can read about some of those children whose lives have been transformed thanks to kindness like yours. Sunday’s newborn baby in South Sudan has a fighting chance. One-year-old Yahya in Yemen has food. Two-year-old Ali in Syria has shoes for the first time ever. Three-year-old Lisa in Indonesia has shelter. Four-year-old Awa in Bangladesh has safe water. 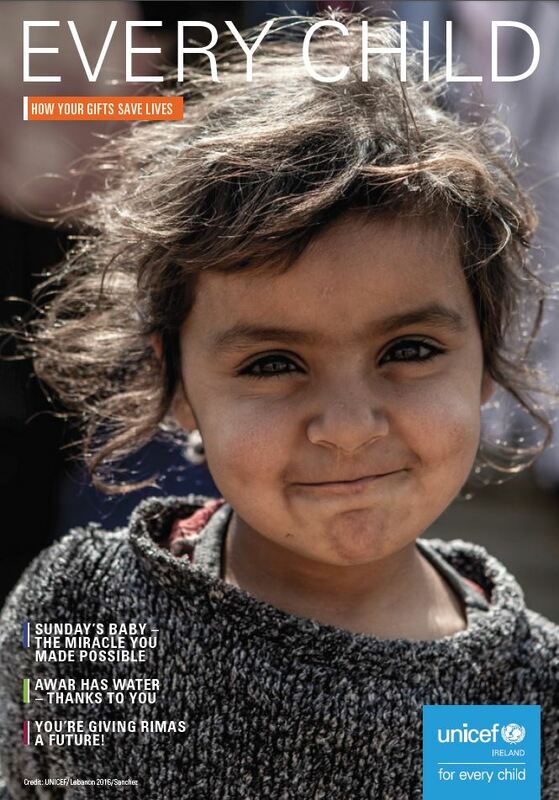 And five-year-old Rimas in Jordan has a place at school and with it the chance of a future. We often wonder how best to keep you updated on how your donations are helping to transform children’s lives. So, we have put together Every Child – a collection of heart warming stories from across the globe, which shows the power of your support. I do hope you enjoy reading it. the orphanage in Syria, where your support helps children who have lost everything in the six year conflict. the emergency response to keep children in Haiti safe from cholera, and lots more. 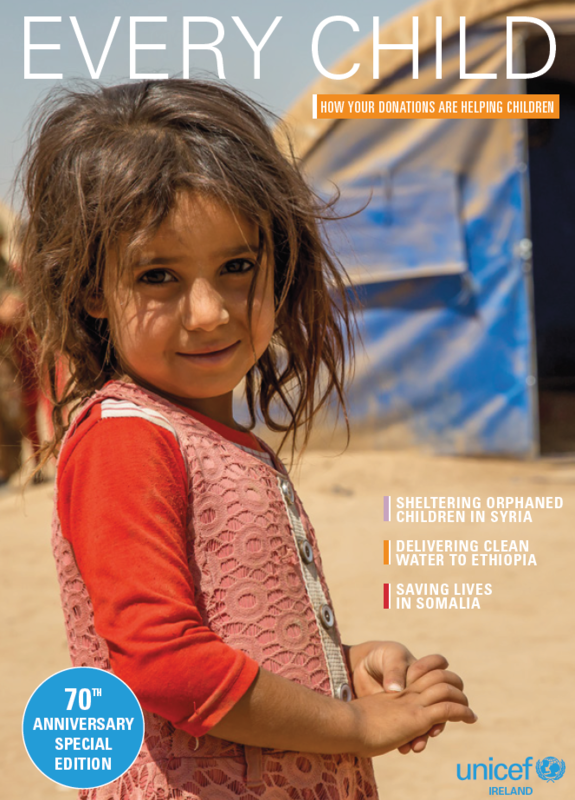 If you have any queries or feedback, or if you would like receive a newsletter by post please call Siobhan on 01 878 3000 or email siobhan@unicef.ie.